And FWIW Sesame Street had just started to air just when I was old enough to watch it...fond memories of the Yip-Yips talking to a phone...."BAAAAAAAAAAAA-RING!!" @Threemoons I was just going to comment roughly the same thing-- such a positive start for the week. "Happy happy happy happy boing boing boing boing!" Also always glad to hear some T.O.N.T.O. Hey Joe, was TONTO before Stevie Wonder took advantage of M & C? Hope you have recharged the batteries. ...and my swag arrived!! going to pick it up this week at the house i just moved from..
@steve if your head was full of the right combustibles it was exploding. Every time I read uniformed policeman, I see it as uninformed policeman. hi Joe, welcome back! I pretty much just listened to Dondero High School Chorus the whole time you were gone. Are we going to get a sniff of Beaver and Krause? Hey, everyone, welcome to the program! Happy to be back with you this Monday morning. @annie: So glad! @steveo: Great stuff! @Brian: New batteries put in. Wow. Tonto's... We used to get high and listen to the album at 16rpm! Good Morning My Freeform Family!!! Cheese on the needle, eh? Wow, I recued this record because I thought there was fuzz on the needle, but it seems to be just the record. Sorry, pals! Morning, Joe! Digging this set!! Welcome back Joe! Swell start to today's show. This sounds like if M.I.A. never met Diplo. The needle is just about hanging in that groove. very apt observation Vincent! and SO true..
Welcoming heavy Judy Henske rotation on WFMU! Can soneone list the famous singers directly influenced by Judy? @doc I did not reply to your question yesterday. Looking for houses, no luck yet. No rush, we have until the end of the world. Thanks, Steve and John and steveo! @Guido: Grace Slick, most definitely. Randy Newman...his singing/music always puts a lump in my throat (even for Disney). Dark Matter was the name of Jeffrey Davidson's premium about ten years ago. Thought you would be interested!! i was just thinking that same thing DocJazz; a very dif reaction that what i have to John Prine. close,..
A coworker once pointed out how many songs Nilsson recorded about being "without you." @Brian in UK: who is 5? Billy Preston? Thought it was Brian Epstein. Re; Beatles- leave us not forget Stuart Sutcliffe, the original 4th member. Perhaps Stuart Sutcliffe's influence was more in the fashion line, no less important at the time. Also, for singers/songwriters that bring a lump to one's throat, a lot of Ray Davies does it for me. Joe, did you just turn into Father Mulcahey for a second? @The Oscar. John, Paul, Saul & Ringo, has a ring(o) to it. Time for Autumn Almanac soon as for Waterloo Sunset. Epstein, their first manager, got the grease out of their hair and the leather jackets off their backs, made them suit-and-tie wearing mop tops and WABANG, Beatlemania. That earns Brian 5th Beatle status. Did yinz have a good vacation in PA, Joe? Hey Joe, thanks for the Mekons! And 'personally hand delivering' sounds like a lot more effort than it actually took to drive from Hoboken to JC. Joe! It was an honor to have John Doe's voice on a fader. He was fantastic! Thanks again, Tim! @Chop Scott: Great work helping him sound so good! now I wanna go see X in September. great SHOW Last week with Mr. Doe...! Sorry @Hubadoo have to agree with @Brian... the Beatles as we know them now on record would not be the same without George Martin. Not to forget that with Stu Sutcliffe there were actually 5 Beatles. He's no "John Doe" to us!!!! Yes, if you missed the John Doe show, look for audio/video in the future. Really worth hearing/seeing. I spent some time in a dive bar this weekend as I'm reminded in this song. Heya Joe! @The Oscar, just watched your Tenth Moptop vid. Nice work! Hearing John do this last week gave me chills...I blamed it on the Air conditioner! And the tear in my eye on dust!!! BIG STRONG MAN..I AM...NOT!!! Nice to have you back, Joe! "Here Comes a Regular" should ideally be played early in the afternoon, before you should really have a drink. Hey Joe, this Scorpio has been groovin to your premium, nice work! YESSSSSS!!!! I just adore this Frankie Lymon record. Morning Joe!! @Santos: So glad that you like it! Had so much fun putting it together. Hey, Sheila B! Pardon the wiggle! @Parq Hey, thanks! It was a lot of fun to make, and I'm still pretty proud of it. (I'm the one with the mustache, incidentally, and I do the assorted Beatle voices). Oh Overton Vertis. How sweet. Got to get a wriggle on, taking the dog to the vet. Morning, Joe. Late but here. Single-minded. This Thelma is wiggling, too. It's Wiggle Day. Sorry to have missed you, BiUK. Next time. In honor of Bowie's sort-of return to Twin Peaks? was this bowie song ever included on a compilation? @lloyd: Not sure! It's on the Baal soundtrack from the TV movie, which I think is around. I have 4 songs on a 45, which is cute! "What's your daddy's maiden name?" 1975-6. Very small radio station in deepest darkest Vancouver Island. These guys in town for a gig. I got everybody an eyepatch before they arrived. Blew there minds. And they really did sound just like this. @Sem: Great story! I just found out that Dr. Hook are from Union City, where I currently live. Sem, one of those guys is a pal of mine. I'll ask him if he remembers. That John Foxx single = potent flashback. Good morning, Joe! I've recently begun an ardent fan of Ms. Warwick, heard her most of my young life (mostly on TV), but never thought I would enjoy listening to her records as an adult. They're pretty damn good! Someone should be spinning plates! @pantz Ha! I was thinking the same thing! Dear Joe, that's awesome- I'll have to keep an eye out (figuratively) for her playing in ATL. I would go just to hear "Say A Little Prayer". Love her! @UM 10:53: it would be wild if he did! The listing thing can get tedious, I have to say. yes, glad you cut it short.. I still haven't worked up the nerve to watch I'll Be Me. "I'm Not Gonna Miss You" alone is enough to wreck me. I'll let you know, Sem. @Alex: I really wanted to! Easy to hear why the beach boys welcomed him. I wonder if David Axelrod had some part in this. How could you not, though? Great choices so far! Love this Brian meets Bert arrangement! Glenn was inspired to write 'Turn around look at me' by a flasher in the park. darn you joe mcgasko!! i was going to get the dogs outside and clean the yard of dog crap.. i'd rather stay inside..... first world issues, i guess. Glen's song to his cat. I love it. 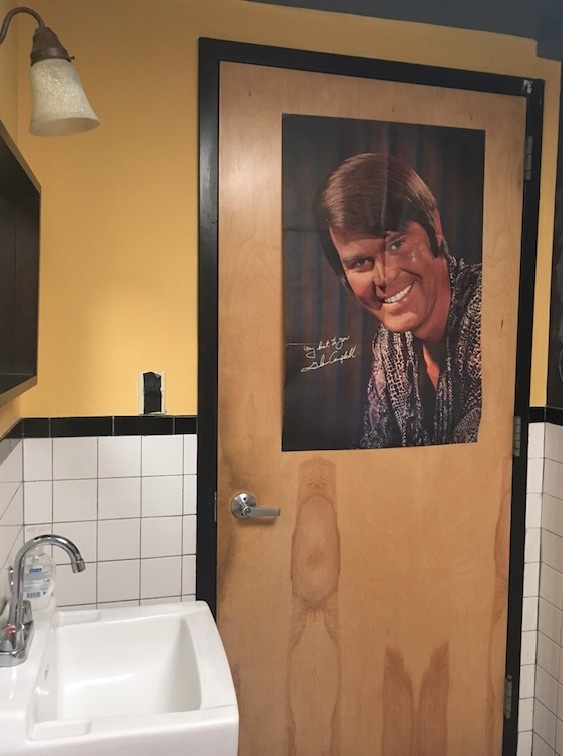 Jeez - I was on vacation last week and totally missed that Glen Campbell died. Thanks for the tribute, Joe. I wonder how this cover was received at that time. PS - I came back from vacation to find my swag waiting for me....thanks Joe and WFMU! I was even surprised that I won an Allah-la's CD which I didn't know about. Thanks to whatever DJ I won it from!!! great show Joe! long live Glen Campbell! You wanna' cry, you say? Check out Glen's "Ghost On The Canvas", his last CD. I love it but have to "budget" listening to it. @Itzall: That's a killer diller. @Dennis: Hey Dennis, thanks for tuning in! @Mike East: Congrats, glad you got your stuff! Itzall, "Adios" is Glen's final release. @Joe, ditto what Mike said. My swag arrived and I'm very happy. @Uncle Michael: Great news! Scott, Michele, and the volunteers have been working hard to get the swag out the door. @Sem, from my pal: "Yeah. I even have a picture of that lying around. Jance, of course, had the patch on the wrong eye." Im 63 and this song is killing me. I'll jump on the "Thanks for the Swag" train! I got mine a while ago, and I couldn't be happier! And thanks for the Kamasi Washington, Uncle Michael! It hasn't left my car CD player since it arrived. Haha! That's super. Thanks, UM, made my day. I'm enjoying my swag, too. I'm pleased to have made someone's day. I like talking country songs. Thanks for the tribute to Glen! So nice to be reminded of how sweet his voice was. Hi Uncle Michael, thanks- I did not know that. Now I have ONE more that I haven't heard yet. No, wait!. That was perfect! 45 please! That sounded great! And after that, 16 rpm. That'll bring up the bass. Welcome back, Joe! We're late this morning - didn't tune in until the Dionne Warwick (great record!) - but loving it. Wonderful Glen Campbell tribute, too. I am so loving this lovely tribute but I also loved the bagpipes at 45rpm, Joe. A fine set, Joe. Timeless voice, thanks so much. Nice selections. Good to have some accidental 45 now and then, too! Please Summer Nights just to end on an up note. Just have a glass of wodder and take er easy, Joe. my favorite of his! thanks for this. I timed the return perfectly. I need you more than want you and want you for all time. One of my all time favourite songs. It slays me. We had a cat who used to go all blinky when he heard this song. Thanks for listening, everybody! Stay tuned for Three Chord Monte for some more Glen. Have a great week all! If he had just been a member of the Wrecking Crew that would have been enough.